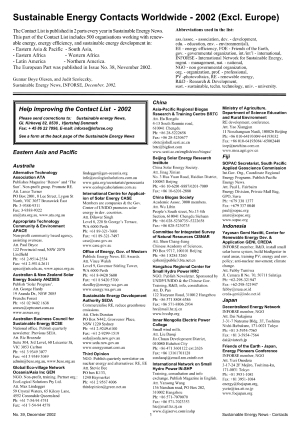 It is possible to download a pdf file of issue #39 - Contact List - World 2002 (214 KB pdf file) 14 pages. About 500 adresses of organisations working on sustainable energy: renewable energy and energy efficiency. In each regions, the list is sorted alphabetically according to the names of the counties.